We collect information from you when you register on our site, place an order, subscribe to a newsletter, respond to a survey, fill out a form, Use Live Chat, register our Subscription Only Contact Directory or enter information on our site. • To process your order of our free materials via our shop. • To keep a count of our website visitor count & location. If you turn cookies off, some features will be disabled (such as login to our chat room, shop, forum and contact directory). that make your site experience more efficient and may not function properly. However, you will still be able to place orders of our free materials. We have not enabled Google AdSense on our site. We market to and collect information from children under 13. • We will not require a child to disclose more infomration than is reasonably necessary to particapate in an activity. • Parents can review their child’s personal information, direct us to delete it, and refuse to allow any further collection or use of the child’s information. • Parents can agree to the collection and use of their child’s information, but still not allow disclosure to third-parties unless that’s part of the service. • Parents can review, delete, manage or refuse with whom their child’s information is shared through through account settings on our website, through emailing our support staff, by mailing us a letter contacting us directly. • Parents can give consent by sign a consent form and send it back to you via fax, mail, or electronic scan or contacting us directly. We, are not with ANY denomination. We are an Independent group of believers in Mashiach. We do not hold the 501C tax exempt status and neither are we a FAITH BASED Facility. F.O.Y are NOT partners with the Government and do NOT have a main headquarters in any region of the world. Our head is Yahushua Ha Mashiach. What makes F.O.Y. 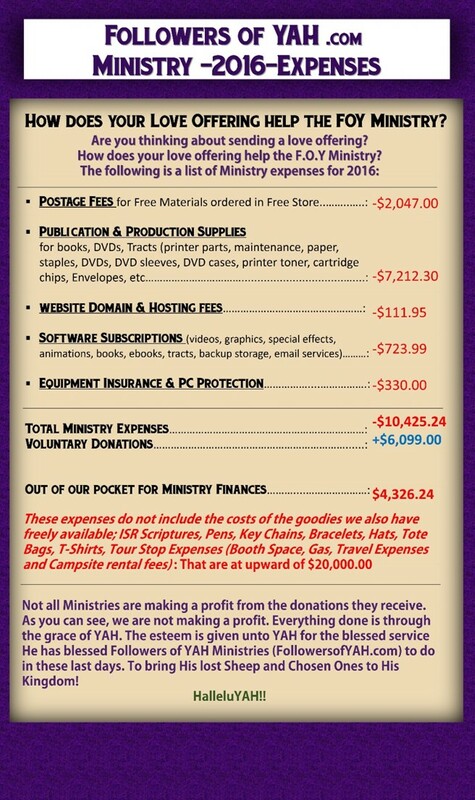 different from other ministries is the fact that we are a 100% FREE ministry. Our many free books and tracts and DVDs will equip you in helping us reach the Lost Sheep of Yisrael! Let us blow the ram's horn together! How does your Love Offering Help the F.O.Y. Ministry?